In addition to a comprehensive work on new rolling stock and infrastructure, SkyWay Technologies Co. is constantly developing in another, less noticeable, but no less important direction  in creating a comfortable and safe working environment for the Company's engineers. This time, the Company-developer of string transport has received a certificate confirming that it has developed, implemented and maintains a health and safety management system. Certification of Company's management systems allows optimally, in accordance with international standards, to adjust the processes going on in the Company and to obtain documents confirming it. Such confirmations may be of interest to potential partners and customers  we show them we can work at a high level through such certification. 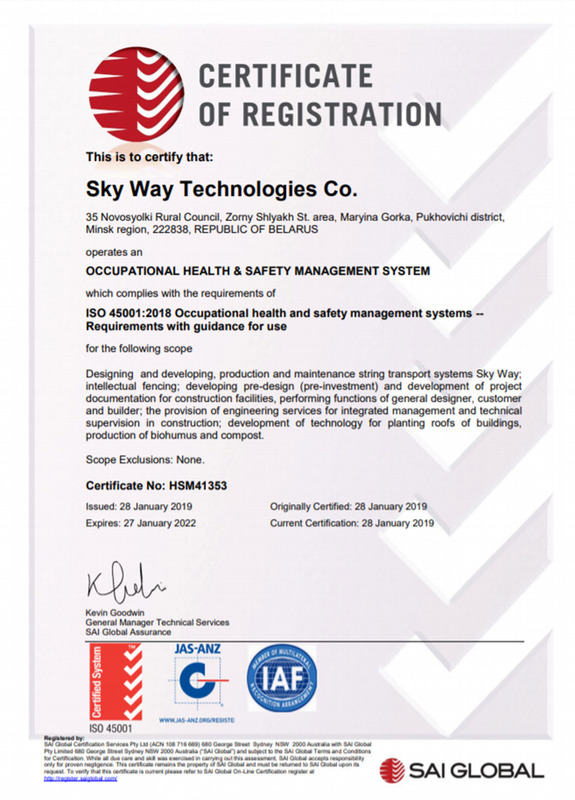 Certification was carried out by an auditor from the international company SAI GLOBAL, whose representative pointed out this was the first certificate issued by their company for compliance with the requirements of ISO 45001:2018 standard, and SkyWay Technologies Co. was one of the first in the world to be certified for compliance with new requirements in the field of labour safety.